Mitchell on Tuesday released its second-quarter Industry Trends Report, a free source of collision repair market data shops can use to evaluate their business and study the industry. The ratio of supplements to estimates rose 2.72 percentage points to 67.67 in the first quarter of 2018, a 4 percent increase from the prior year, according to Mitchell data. However, the proportion of estimates with a supplement remained flat, up 0.02 percentage points to close at 42.05 percent. The average supplement cost rose 4 percent as well to $936.39 in the first quarter. Aftermarket parts rose to 2.68 components per estimate in the first quarter, up from around 2 parts around 2 years ago. “At the same time, new OEM, Remanufactured, and Recycled parts usage decreased,” Mitchell wrote. OEM parts per estimate fell to 8.41 in the quarter. The average repair appraisal value continued to climb to what Mitchell projected was $3,196 in the first quarter of 2018, up more than $100 from the prior year. While comprehensive damage barely registered a gain, the average third-party and collision repairable vehicle needed an estimated $154 and $194 more than a year ago. This probably can be attributed to crummier 2018 weather producing worse crashes than the prior two years’ January-March time periods, though perhaps more complicated or replace-only repair procedures made a minor contribution. The average repairable vehicle fell to 6.8 years old, down 0.18 years (more than two months), which suggests it was more advanced than than the 6.98-year-old and 7.1-year-old vehicles in the first quarter of 2017 and 2016, respectively. 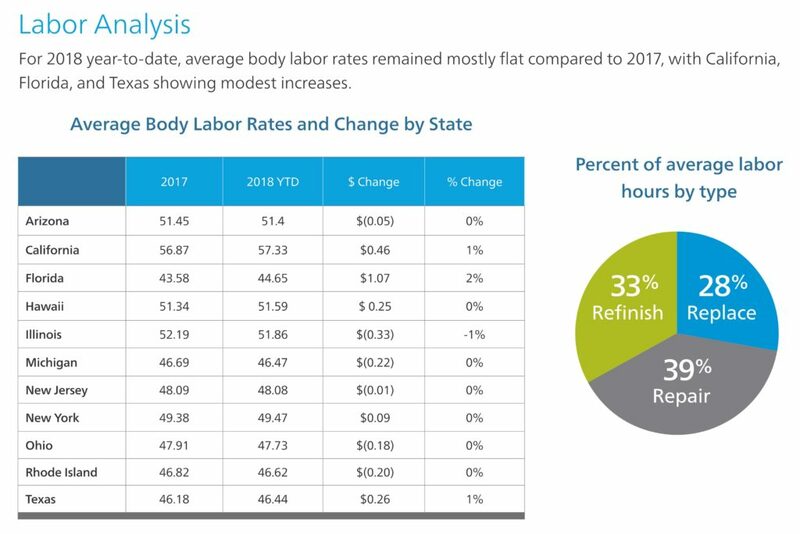 Despite insurers’ squawking predictions of higher repair costs in their push to circumvent California Department of Insurance reforms targeting labor rate survey abuses, the average California labor rate only is up 46 cents over the prior year, an 0.8 percent gain. Despite similar squawking in Rhode Island that repair costs will rise because of a bill expanding OEM parts choice, insurers there are actually catching a break so far on one aspect of the repair. Labor rates there fell $0.20 cents to $46.62, down 0.4 percent. If the complainant is a national insurer, they’re also enjoying stagnant labor rates in many other states as well, based on the Mitchell data. May 2018 saw an inflation rate of 2.8 percent over the prior year, according to the Bureau of Labor Statistics. 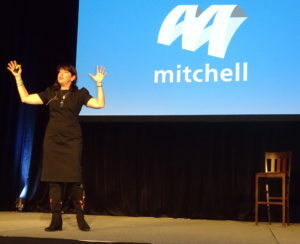 Finally, shops daunted by the process of using these or other statistics to make business decisions might find guidance in a Mitchell column contained in the Industry Trends Report. Though insurer-facing, the lessons in Mitchell claims performance director Ryan Mandell’s piece can be taken to heart by any business. You also don’t need to use the data to make a sweeping overhaul of your business. Little victories make you a better company, according to Mandell, citing a 2016 McKinsey Quarterly piece.